A rally against New York’s newly enacted gun control laws drew one of the largest crowds to the State Capitol in recent decades. The several thousand mostly white men, many dressed in hunting outfits and carrying American flags, filled the one square block park outside the Capitol. They expressed their anger against the recently enacted toughest in the nation gun control laws championed by Governor Cuomo and approved by the majority of state legislators. Many held signs, including one that equated “Cuomoism “ with “Stalinism” and “Nazism.” Another called the new statute the “Civil Rights Assault Law”. They chanted that they would not obey provisions that will require them to register more types of guns. NRA President David Keene aimed straight at Governor Cuomo. “Cuomo must go,” the crowd chanted at various times throughout the rally. A handful of Republican State Senators who voted against the gun law spoke, including Senator Mike Nozzolio, who represents a mostly rural region near Rochester. Assemblywoman Aileen Gunther of the Hudson Valley, was the lone Democrat to speak. She told the crowd she’s an NRA member and owns a pistol. State police estimated the crowd at around five thousand, making it one of the largest demonstrations at the Capitol in recent years, but short of the 10,000 that organizers predicted. James Lytle, of Horseheads, who held a sign saying “with guns we are citizens, without them we are slaves,” says he doesn’t own a gun himself, but came to stick up for the principle of the second amendment. 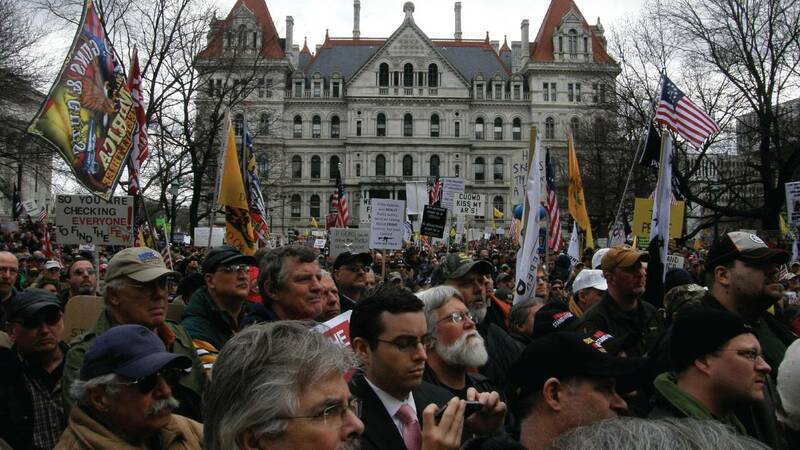 Governor Cuomo was not at the Capitol. The governor was giving an address about his State of the State message and budget plan in Brooklyn. One day earlier, the governor said 70% of New Yorkers support the new law, but he respects the right of the 30% who don’t to protest. And he says he knows it’s controversial, and says it’s “one of the reasons why society hasn’t done anything about guns and one of the reasons why we’ve lost so many innocent lives." Senate Co Leader Jeff Klein, a Democrat who voted for the gun control measure, says he considers it a major accomplishment. Governor Cuomo and lawmakers are planning some minor amendments to the gun law. They inadvertently forgot to exempt police officers from possessing some of the assault weapons. They are also talking about making an exception for movie productions who may use assault rifles when making films in New York. Protesters at the rally say it should be repealed altogether.